Jane Blundell Artist: Brown Inks - sketchbook exploration. Brown Inks - sketchbook exploration. In this page I began exploring other inks for use with a dip pen with or without a water wash.
Up the top left is Daniel Smith Walnut Ink. This is also the first of the solid rectangles at the bottom right. It is a fairly thin raw umber colour - a cool brown. It is not waterproof, but if re-wet it remains true to colour so creates tints of itself. Only for use with a dip pen. Not a necessity but I think it would be very nice to explore with a reed pen. Left of the nib sketch is Noodler's Kiowa Pecan ink, which is also the small rectangle at the bottom right of the page. This is a fountain pen ink but I'll only use it in a dip pen. It is not waterproof and the colours that bleed out with a water wash are quite harmonious but I think I'd just allow it to dry and leave it alone if I use this one to draw with. 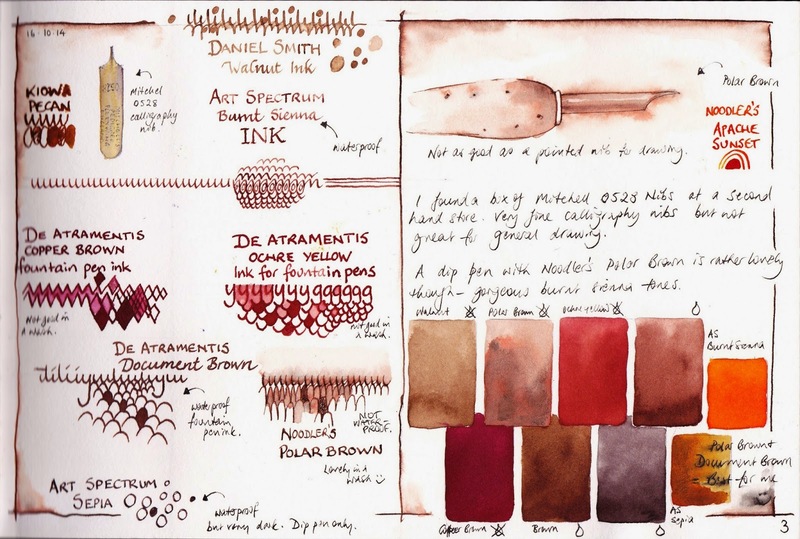 Art Spectrum Burnt Sienna Ink is a lovely ink to use with a dip pen and add wash while wet. It is basically waterproof once dry. It is a pigmented ink and not suitable for fountain pens, but lovely with reed pens, sticks and nibs as well as a brush and wash. It comes in a small but also a 1 litre bottle so is a great one for teaching and really splashing around. It does need a good shake before use as the pigment settles to the bottom. De Atramantis Copper Brown was one I bought to try as a sketching ink in a fountain pen. It is almost an Indian Red colour, but in a wash it shows as a crimson. I think it is best used as a stand alone ink in a pen or with a dip pen rather than with watercolour. It is the rectangle at the bottom left of the group. De Atramentis Ochre Yellow was the closest I could find for a Burnt Sienna fountain pen ink. It is also a really nice colour in its full strength but quite orange in a wash. It's the middle rectangle on the top line of the group. I wanted to use it with watercolour and allow it to soften in a wash but found the orange too much in most drawings. Interesting as a pen and water wash only though. So both the ink I bought to use as water-soluble inks have been a little disappointing for that task - they are better just used straight or washed over with water only. I'll go back to just using water-soluble pencils for this task. De Atramentis Document Brown, also shown in the middle rectangle on the bottom line, is a winner. It dries quickly and is then waterproof and is lovely in a fountain pen. It flows well, is a great burnt umber colour, and being waterproof I can add watercolour without the strange colour change that I was getting with other non-waterproof inks. The black is also terrific, by the way. Noodler's Polar Brown separates into an interesting range of colours when washed over with water. It is the second rectangle in the top line and also the sketch of the pen. I rather like the effects using it with water but will only use it with a dip pen. Art Spectrum Sepia is another pigmented ink. Very dark and waterproof, but only for use with a dip pen. It is so dark that it is rather like using a black. It is the last large rectangle in the bunch. Finally Noodler's Apache Sunset - a pretty orange colour that I may use in a fountain pen but not for drawing. It is the bright orange small rectangle in the group. So my conclusions from my scribbles and swatches is that I'll use the De Atramentis Document Brown Ink in my fountain pens for drawing and writing, and the Noodlers Polar Brown or Art Spectrum Burnt Sienna with dip pens for pen and water wash. Thank you for this illustrative and interesting post. I love using Noodler's Kiowa Pecan ink in my Lamy pen and as a dip ink (I did not realize it was not waterproof) as I found the Daniel Smith Walnut Ink too "faded" looking for my taste. My favorite brown dip ink is Winsor & Newton Drawing Ink Nut Brown (but I would not put it in a fountain pen). btw, your watercolor mixing chart book has been an invaluable learning tool and resource for me. Thank you Charlie :-) I agree the Daniel Smith ink has a watery faded look. I think it needs to be applied with a reed pen or something that will put a fair bit down. I am very particular about what I put in my fountain pens now having had a couple get 'eaten' by the inks so I now use most of my inks only with a dip pen. I love dip pens but they really are best at home. When sketching en plein air I use them with watercolour rather than having a bottle of ink to juggle (or spill) along with everything else. I love how you do these color comparisons. Brown ink is great and this is so helpful. Hi Jane, Thank you for sharing this info on waterproof inks for fountain pens, especially the Lamy pens, which I prefer. Looking on Amazon for the De Atramentis Brown, I see all kinds of descriptions - cedar brown, copper brown, etc. but no plain brown. What is the full description of the brown you mention in this post? It is simply called 'De Atramentis Document Brown'. Only the Document colours are waterproof. I found it at www.gouletpens.com.